Blog A Book Review: "Now, Discover Your Strengths"
Highlight, underline, highlight, underline, dog-ear, dog-ear, dog-ear. Now, Discover Your Strengths is the most demarcated book in my bookshelves. Here’s why: my most commonly occurring pattern of thought, feeling or behavior is that focusing on strengths is the way to stimulate personal and group excellence. Nothing is more powerful for me than to witness the transformation of something, and especially someone, from strong to superb. It takes just as much effort to take something from below average to slightly above, so why not take what is already strong to the next level? 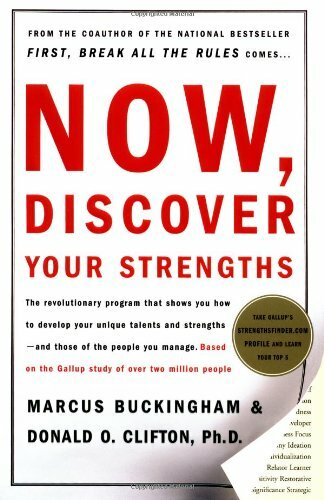 Now, Discover Your Strengths written by Marcus Buckingham and Donald O. Clifton, Ph.D. is my continual reference book for the work I do with clients, helping them understand their natural talents and take them to the next level. There are plenty of resources on the Web about strengths but I caution you to be careful what you access as not all are provided by Gallup, the research group behind the Strengths movement and creator of the CliftonStrengths® Assessment. My bookshelf is also stacked with material from the 5 day training I took to become a Gallup-Certified Strengths Coach. Gallup researchers, trainers and a bevy of other certified coaches are available to those of us who have completed the education. But I keep coming back to this book. Here’s why it is the place for you to start as well if you want to better understand your natural talents. The authors’ premise behind writing the book was to start a strengths revolution. “At the heart of the revolution is this simple decree: The great organization must not only accommodate the fact that each employee is different, it must capitalize on these differences.” That is simply revolutionary in itself. The book then explores the science behind what was discovered in over 2,000,000 interviews with excellent performers in fields as diverse as teachers, doctors, salespeople, lawyers, professional athletes, housekeepers, stockbrokers, and the list goes on and on. Of course they found tremendous diversity in knowledge, skill and talent. Most importantly, what they kept hearing were the repetition of several distinct patterns of thought, action, or feeling that led to the development of the 34 Talent Themes revealed in the CliftonStrengths® Assesment, this book and StrengthsFinder 2.0, as well as many more companion books. The book includes a code to take the assessment online. It dives into the 34 different themes, providing descriptions to help you better understand how the theme may manifest for you. Multitudes of examples of strengths in action are sprinkled throughout the book, helping you to grasp which areas of talents are innate for you and how you can take those talents to strengths. With any assessment of this sort that helps you explore who you are, there are bound to be questions about the outcomes. Are there obstacles to building my strengths? How do I manage around my weaknesses? Is there significance to the order of my themes? Why am I different from others with whom I share similar themes? How can I use this with my team? What does it take to become a strengths-based organization? All these questions and more, as well as the technical report on the Assessment are included in this fine book. Or you can simply work with a coach who can synthesize and personalize all the available information on Strengths for you and your team. What is the best use of your time?